Making the world more fun one RC helicopter pilot at a time. Howdy! My name is John Salt - the funny face behind this website. 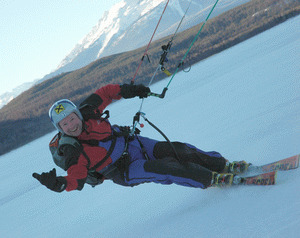 Yep, that's me kite skiing. I find kiting an equally fun backup activity when it's just too darn blustery to get an RC helicopter airborne. I've always had a healthy interest in anything that flies, but helicopters, both full size and RC top the list. I didn’t think I needed an "about me" page, but perhaps you want to know if "is this guy for real or what?!" To say I'm passionate about all helicopters would be an understatement. For as long as I can remember, I've been fascinated by them. I'm intrigued by how and why they can fly, I love how they sound, I'm amazed at what they can do. Helicopters are mechanically marvelous. 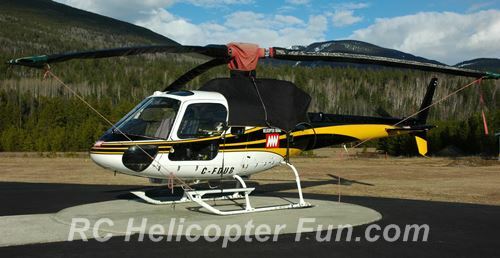 I so wanted to become a full size helicopter pilot and did briefly pursue that ambition in my early 20's. I reluctantly realized however after completing ground school; to get to the point where I would be certified on turbine to land a job afterward, it was just not financially feasible to carry on. Moreover, there were very few job prospects even if I had the money to continue on with the training. It goes without saying, I was quite depressed after giving up on my dream career. I then looked into becoming a helicopter technician as it would be a way I could still be surrounded by daily awesomeness; but again, job prospects were few & far which lead me to the automotive technician trade. Still a rewarding career for someone who enjoys mechanics and electronics, but cars don't fly (at least by choice). I naturally still love flying in full size helicopters and do so every single chance I get. Who wouldn't! 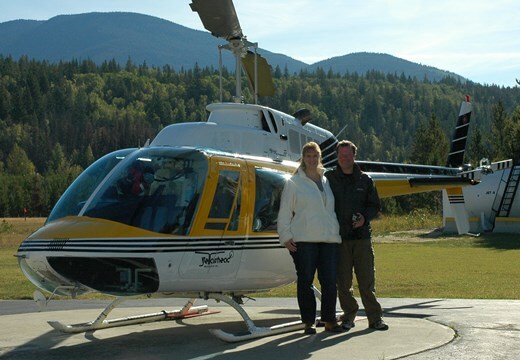 The better half, myself, and a cute Bell 206 after a recent flight to celebrate our anniversary. So, what's a helicopter passionate person to do when they can't fly or work on full size? That's easy, you do the next best thing - take up the hobby of RC helicopters! I quickly found out after taking up the hobby in 1989 and talking to other RC helicopter pilots while instructing up to 2004, most of us all have that same fascination with helicopters. Many also had similar ambitions of flying or wrenching on full size; but realized it was an out of reach or impractical career path, and took up the vastly more affordable RC heli hobby to fill the void just as I had. Others actually did fly or wrench on helicopters while in the military, and then got into the RC variety once they left or retired. I've been at this hobby now for 30 years and I keep hearing amazing stories like this over and over. Seems we are all very like-minded with this fundamental interest in flying egg beaters. Life Can Throw Us Many Curves; Not Limited To Pitch & Throttle Unfortunately. Flying RC helis and introducing newcomers to the hobby most weekends, while work at the automotive dealership during the week. I was in my prime and reaching the zenith of my chosen career path. All that changed after being hit with a career ending heath issue. I was devastated! Next to my wife and family, the main thing that kept me going through this rough period of uncertainty was still being able to get out to fly my RC helicopters. Helis helped immensely push the worry and fear to the back burner, while providing much needed focus and stress relief. It's too dramatic to say "RC helicopters saved me", but boy did they help! As it turned out, they also gave me a fun and exciting new path to follow. My wife and I had to make some big lifestyle changes, which included moving from the busy city to a very quiet small town. That is when I decided to start this website back in 2008; with the mission to share my passion, knowledge, and experience with RC helicopters. This site has provided a platform for me to continue helping people just like you, from all over the world successfully get into the hobby to fulfill a bit of that full size helicopter flying dream too, albeit with smaller machines. "Making the world more fun one RC heli pilot at a time" is not just a cheesy title at the top of this page, it's what really happens here every day at RC Helicopter Fun.com, and has been happening for the past 11 years now. The hundreds of gracious and inspiring testimonials I've received over the years such as the one below are affirmation of that. "Hello John - I don’t normally do this but I just had to write and compliment you. 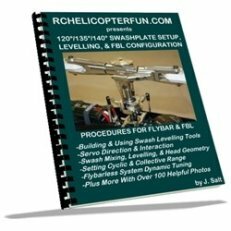 I was about to give up on learning to fly r/c helis when I recently discovered your website. Over the past couple of years I've purchased and destroyed 2 Helimax Novus CP's and a Blade SR (each one not a particularly expensive bird, but...) while trying to learn how to fly. I've spent around $1000 on these birds between the original purchases and subsequent fixes. Talk about a false economy! I was at the end of my tether and about to give up when I discovered your web site. I read your articles, and then purchased most of your ebooks; the smartest thing I ever did! Your 3 step recipe to success (buy a 450, get a computerized radio, tame down the settings) is golden. I subsequently purchased the Align 450 Plus RTF, tamed it down per your e-book, and I haven't looked back since. Even though this bird cost over twice the price of one of my previous ones, it would have saved me half had I been aware of your advice from the get go. I'm now having a lot of fun flying it and can't wait to get home from work each day so I can fly it some more! Thanks again, Martin Blackburn - United States"
RC forums, websites, blogs, and flying clubs worldwide have linked to my site and many of the pages. Wikipedia has also referenced several of my pages in their Radio Controlled Helicopter article. This is my idea of a perfect day. No explanation needed. My views on starting into the hobby may be different from what you'll likely first see and hear in the marketing noise of today's instant gratification fix & disposable society. 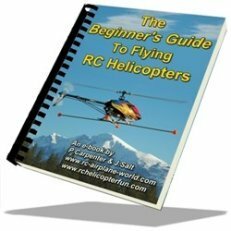 They are however exactly in-line with what you will see & hear if you ever went to an RC helicopter flying club, fun-fly, or talked to an experienced RC heli pilot or instructor to learn more about the hobby. For instance, I firmly believe if you are truly interested in getting into this hobby; like most things in life, you will get as much out of it, as you put into it. This generally means first spending some time researching the subject so you at least have a moderate understanding of what you are about to get yourself into. 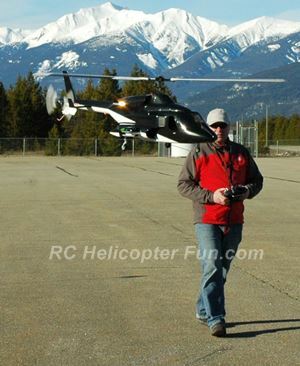 That's the first step in your RC heli journey I hope my little RC heli site can help you with. Next comes investing into the hobby by getting decent quality equipment (name brand hobby grade) to start with and then grow with it. No, you certainly don't need to spend a fortune on top of the line gear, but it shouldn't be low quality junk either. I also believe people can start into the hobby out of the gate with collective pitch if they do their home work and know exactly what they are getting themselves into (yep, more research on this site). Right or wrong (and it won't be right for everyone), that is exactly how I approached the hobby myself all those years back. I was totally infected by the "RC heli bug" the very first day out, and quickly became obsessed! Luckily, I had decent equipment there after to fuel my growing obsession. I talk about my first RC helicopter and the story behind it on my RC Helicopter History page. A lot of advertisements & recommendations I see today given by so called experts (marketing experts perhaps), are focused around cheap low quality RC helicopters that you will out grow quickly or end up spending a small fortune on in upgrades - if they even fly at all. I want to put an end to that; or at least show you what other possible options are out there that are much better suited to your long term goals, along with the complexities involved in some of this stuff. You may for example find out after spending some time on this site, that "RC helicopters are not the hobby I'm looking for". Better to find that out now early in the game, then after dumping a large sum of money on an incompatible pastime. 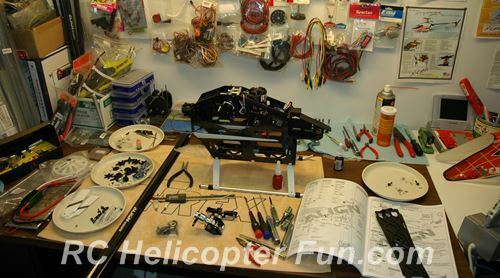 Working on an RC helicopter is half the fun! If you don't feel the same way however, this hobby might not be a good fit. The other largely popular belief I hear about this hobby and one I strongly disagree with is, "crashing & the ongoing expense involved in crashing is just part of the hobby"; not true! Yes, it certainly can be like that if you constantly fly beyond your skill level, don't understand some heli basics, don't follow some sort of lesson plan, your equipment is not well cared for, or you simply think that you must crash to have any fun. The simple truth is crashing does not have to be a part of the hobby if you don't want it to be. I so rarely crash, even when I was a self-learning newbie beginner. I had no interest in pushing my limits when I first started (still don't) and that is why I and others who have this same cautious approach to piloting an RC helicopter rarely crash. I also hear the statement all the time "if you are not crashing, you are not learning". Well, the hobby to me is about the fun and the journey; not about trying to pull off an aerobatic 3D maneuver that is well beyond my comfort or skill level. If I crashed nearly every time I went flying in hopes of mastering a new aerobatic maneuver, I would have given up on this hobby years ago. I could not afford it financially, nor the time involved with the ongoing repairs. I also don't like feeling scared the whole time I fly. I want to relax while flying my eggbeaters and only get an adrenaline rush at the time of my choosing. Again, these are just my view points and we are all very different in what keeps us motivated. If pushing the boundaries to get that adrenaline fix is what floats your boat and keeps you focused and interested in the hobby, go for it. I only wanted to make mention of this "crash topic" for those of you that have always wanted to get into the hobby, but were put off by the "crashing is part of the hobby" nonsense. Crashes will still happen from time to time however even if you are a cautious flier like me due to mechanical/electrical faults, disorientation, & pilot error; but they can be rare occurrences. My Last Respectable Crash Now Over 5 Years Ago! Long before I was dreaming of becoming a full size helicopter pilot, I was an RC junkie from the age of ten or so. I started with RC cars and then got into RC planes when I was fourteen – bless my dad for driving me to local RC flying field almost every weekend. My father was in the Canadian Air Force and then became an aircraft instrumentation technician. Obviously his passion for aviation, aircraft, mechanics, and electronics wore off on me. I was always getting into his test equipment and tools in the workshop. I honestly don't know how he put up with me as I was a curious, and at times destructive little bugger. I often took things apart to see how they worked (still do), from my toys up to much more interesting things around the house such as the washing machine and the TV. I specifically recall those two because of the punishment that was rightfully earned afterward. My parents said my first word was "wire" so it's no wonder I was such a little hellion around all that cool and interesting equipment. Looking back, dad went out of his way keeping himself sane and me safe; while teaching me basic electronics and mechanics while he made me help put all the stuff I took apart, back together. I personally feel to really enjoy this hobby and get the most out of it; you have to have at least a basic interest in some, if not all of those aforementioned fields. By "basic interest", I mean you either know some of the very simple basics already, or are willing to put a bit of time into learning some of it. At any rate, I can’t thank my dad enough for the help, support, and wisdom in those early years when I thought I knew everything, but now realize I knew nothing. Dunning Kruger effect in full force I'm ashamed to admit. Thank goodness I outgrew that ignorant, childish mindset. If there is one thing this hobby teaches us, it's humility! An RC helicopter at the flying field - I was hooked! I saw my first RC helicopter that one of the members brought out to the flying field. I could not believe my eyes and was in a state of awe. After several more years of flying RC planes I finally got my first RC helicopter, and 30 years later... guess what? I'm still in awe of this hobby! I still dabble in RC planes & cars but they just don't come close to the passion I have for RC helicopters. The challenge of building and flying a heli, learning about how & why they can even fly at all, the physics, the maintenance, and the many forms of flying styles, simply makes this hobby the most rewarding and fun I find. Crazy maybe, engaging - no question. I suppose the other thing I really like with RC helicopters is we can fly them outside year round. Living in Canada where we have 6 months of winter and 6 months of poor skiing; this is something I can't do with planes because the take off field is covered in several feet of snow during the darker cold days of winter. With an RC helicopter, all you need is a small packed or snow cleared area to take off/land, and the sky is your oyster. In short, I don't let my helicopters collect dust after a little snow falls on the ground like their wing bearing brethren do. As long as it's -5C or warmer, sunny, and the wind is not blowing like hell; you can often find this obsessive RC helicopter nut outside flying 12 months of the year. I've been so fortunate to witness first hand the evolution of this hobby for decades now. Starting with nitro power, wooden blades and mechanical tail gyros. Then came carbon fiber rotor blades and helicopter parts followed by inexpensive micro electronics & processors/micro controllers. Allowing the first PCM radios followed by programmable computerized radios; which changed the hobby forever with programmable pitch and throttle curves along with electronic CCPM swash mixing . With better low cost electronics, MEMS tail gyro technology sprouted, and then full on 3 axis flybarless stabilization. This allowed the development of low cost micro sized collective pitch RC helicopters that fit in the palm of your hand. Even more amazing is that they actually fly well! LiPo battery technology is another big one! Not only has it made micro helicopters possible, LiPo's are giving us more power to weight ratios than ever thought possible on our big birds. With all that advancement however - the same exact principles and physics of RC helicopter flight remain, and are just as important to appreciate and understand today as they were 30 years ago. I am by no means a 3D hotshot RC heli pilot. I am more of a sport flier and enjoy simple F3C aerobatics. My main interest & passion however in this hobby is scale. I have also gotten into turbine power which has been so rewarding and a long time dream come true. That said, I still enjoy a relaxing flight or two indoors every now & then with a micro RC heli - yup I'm hooked for life! I can never see getting tired of this hobby – there is simply too much I still want to learn and do. Helping others successfully get into the hobby, has certainly forced me to go back through the years of my own learning curves, experiences, and frustrations; while also learning about new aspects of this wonderful & always advancing hobby. Writing several eBooks has also really helped me hone my understanding of the hobby better. As the familiar adage goes... "The best way to understand a concept is to explain it to someone else." We learn as we teach. What a great experience it is, and I hope you get as much enjoyment out of this site as I have. This message of appreciation for you and your exceptional site is long overdue. I'm sorry that I didn't send it years ago. Because of you and your instructional videos, I now enjoy - immensely - flying RC helicopters and planes. I can't describe how I've felt watching the helicopters and planes that I'm flying in the air. Five minutes of freedom. Like you, I have loved aviation since for as long as I can remember. Planes, helicopters, gliders. Any time I see them flying overhead, I stop to watch. I started glider pilot training while in university, but wasn't able to afford completing it. I'm 55 now and still dream of getting a full-scale license. A number of years ago, I was buying a toy helicopter for my young second cousin. On a whim, I got one for myself. After flying it, I knew that I wanted to explore more realistic and challenging models. So I went to my local RC hobby shop and they helped me pick out a Blade MCPx. Then I went online, looking for help to learn how to fly it. When I found your site and instructional videos, it was exactly what I needed. Your methodology is well thought out and explained. The progression is sensible and the videos are clear and concise. As a post-secondary teacher, I appreciated and admired your approach. 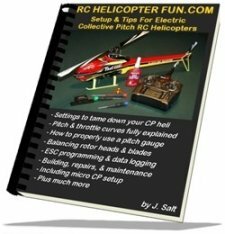 I taught myself to fly a CP helicopter by following your instructional videos. To help with the nose-in stage, I got the Real-flight simulator and discovered planes while using it. After that, my involvement in RC helicopters and planes really took off (pun intended). I fly planes more than helis now, as planes were my first love. But I still enjoy both, so much. Until last fall, I always flew alone at 'bootleg' sites (as the staff at my local hobby shop jokingly said). They kept encouraging me to join the local RC club, which I eventually did last fall. Just yesterday, I was telling one of the members how I got started in RC helicopters and planes. I told him that without your site and instructional videos, I wouldn't have stayed in the hobby. And I wouldn't have had the enjoyment that I've experienced. So, although this acknowledgement is quite a few years late, thank you very much for what you have given me.